Welcome from little Cedaredge, Colorado. 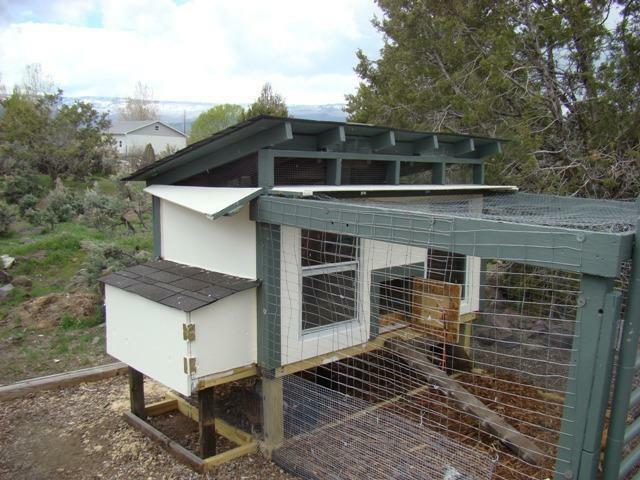 After multiple weeks of work the coop is finished and the chickens have moved in. It turned into a much bigger and more drawn out project than I anticipated but I am happy with the finished product. It is 4'x7' (weird size I know but it matched the lumber from the old swingset mentioned below) and the run is 10'x7' with part of it being under the elevated coop. MATERIALS USED: We mainly used a bunch of wood from an old wood swingset at our rental house in Delta. It was in pretty rough shape and all in 2x6's or 4x4's. I had to rip down the 2x6's to 2x4 size and then get creative with the 4x4's. We bought the plywood for the walls and OSB for the roof at the lumber yard and of course the price went up $2-3/sheet in the month between when I priced it and bought it. The run is 2x4 welded wire on the sides with 1/2" hardware cloth along the bottom. I also put welded wire on the ground under the run out the sides of the run as a skirt and deterrent to the many foxes and coyotes we have around here. The top is lined with chicken wire that I got for free for protection from the multitude of hawks and eagles we have around here. The gate is the headboard off my son's bed that he does not use anymore. We got the windows at the Habitat store for $5 a piece. The shingles and roof stuff were laying in the garage when we bought the house and the roof vents I got for free from a guy--that is why I used so many of them. My advice for any coop builders is to get prices on everything you are going to use in your coop project. The small stuff like washers, screws, nails and caulk really add up fast!!!! TIME IT TOOK: 2+ weeks of working every day that I was off. I work 24hr shifts so I have lots of days off but it took forever to get it done. If I was to do it again I would have started earlier in the year because by the time I finished it the chickens were wwwwaaaaaayyyyyy too big for the tupperware box they were living in. 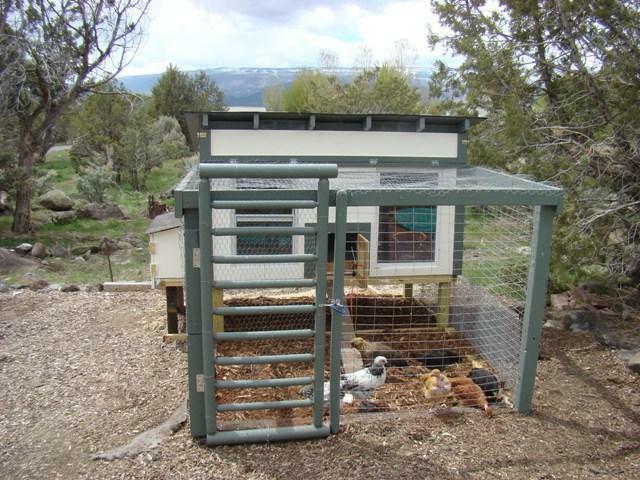 The front of the coop with some chickens that are very happy to be out of their little tiny brooder. That is the headboard/gate there on the front of the run. 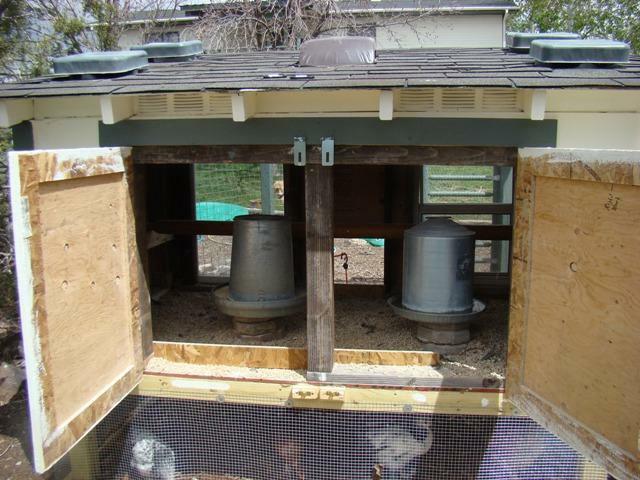 Here is a picture from the side of the coop showing the nest box and the permanent eave vents. 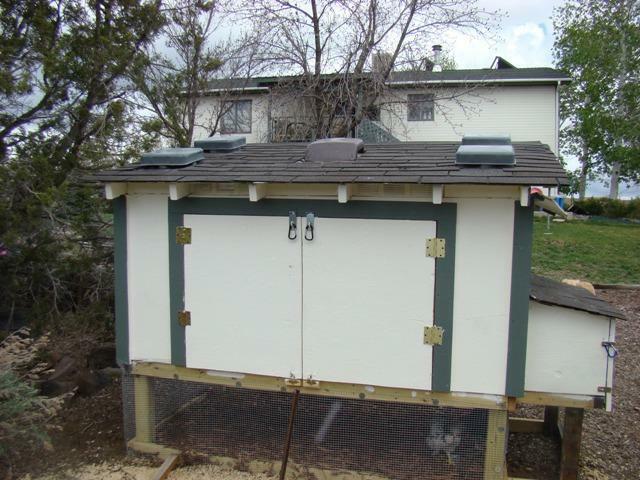 Here is a couple of pictures of the back of the coop. You can see the vents on the roof. I got a bunch for free so that is why there are so many. The way I originally designed it was for one of the doors to be for coop cleaning and did not have a board along the bottom. This did not work and all the litter from inside the coop would fall out whenever I opened the door so that design was changed pretty quickly. You can also see the windows. One opens and the other does not. I got the feeder and waterer for $5 at an estate sale. Notice how the paint matches the house paint--nice touch huh?!?! 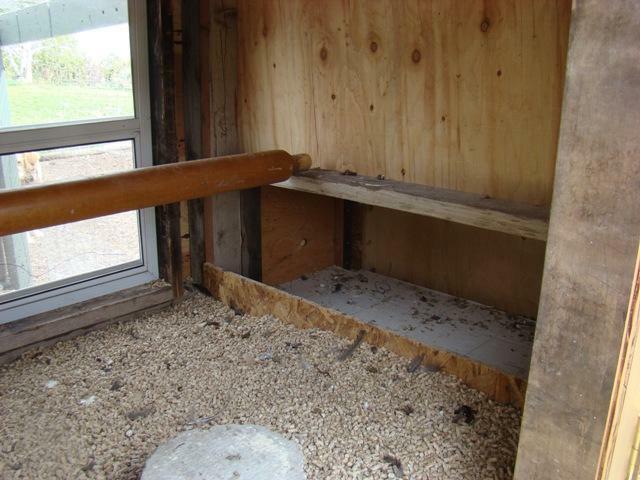 Here is the nest box. I decided to try the communal nest box that some people on here were talking about so we will see how that goes. It opens from the back for access and cleaning. It does not have litter in it because the chickens are only 10wks old and are not laying yet. I will put some in there in the next couple of weeks. You can see the roost too. The chickens have not decided if they like it yet or not. It is made of part of the bed frame that goes to the headboard/gate. 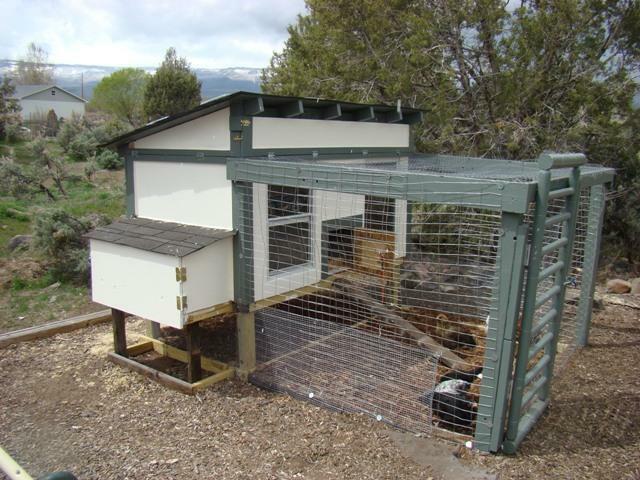 Here is another picture of the front of the coop and the run. 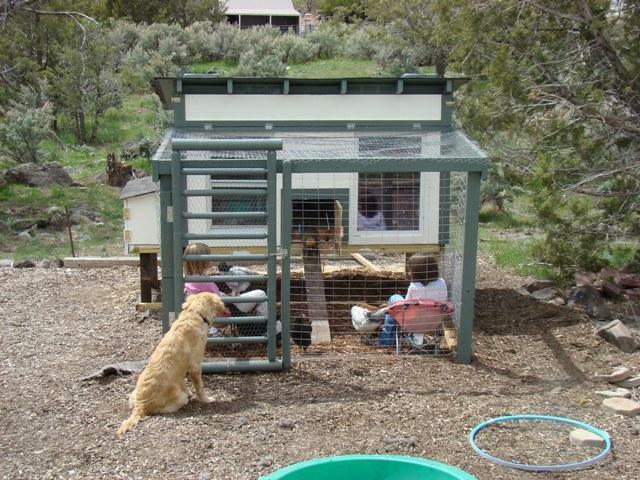 The kids like to sit in there and play with the chickens much to the disdain of my wife. You can see Cooper the dog eyeing the run trying to find a way in--I figure he is a good test of the security of the run because he is pretty strong and keeps trying to find a way in to play with the chickens. So far security of the run is good. I am not too worried if he does find a way in--there have been numerous occasions where he will get near the fence and one of the chickens will charge at him and he will run away with his tail tucked yelping. I like the headboard gate and roost. Be good to have greater detail about the process of building.